Peter Casey has offered Joan Freeman a five year loan, towards the cost of her presidential campaign. 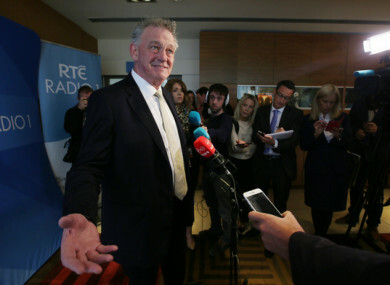 PETER CASEY HAS offered to give his fellow Presidential candidate Joan Freeman a loan. Freeman, the founder of suicide prevention charity Pieta House, has spoken publicly about her difficulty in raising funds for the race to the Áras and has so far secured a loan of €120,000 from businessman Des Walsh. By contrast Casey used a helicopter to get to and from council meetings in order to secure his nomination to contest the election. Speaking in an interview on RTÉ Radio 1 today with Sean O’Rourke Casey claimed he had already offered Senator Freeman a loan with an interest rate of 7% on a five-year term this morning. I offered to do it at 7%… if she wants it at 7 I’ll do it…but it’ll be a five-year loan. The presenter asked if he was serious? a laughing Casey said, “yeah if she wants it at 7% I’ll do it”. On hiring a helicopter, Casey told O’Rourke that he was very late into the race and said that the President “took so long, delayed announcing his intentions to stand” that because of that Casey had 10 council meetings to attend in one day. “It wasn’t that expensive anyway” he said. Casey said he is funding his campaign by himself, “it’ll probably be somewhere between €80,000 and €100,000″. The former Dragon’s Den star has found himself under the media spotlight over a number of controversial statements, including a video tweet claiming “the only driver he would bring to the Áras, is his golf club”. Casey told O’Rourke he didn’t think the video through. Like many of my golf drives that’s eh.. one I’d like to have a mulligan (a golfing term for a do-over) on. It wasn’t one of my, I didn’t really think that one through. (It’s) Certainly a moment if I was taking it again, I’d drive it down the beach. Asked by O’ Rourke if he tends to speak first and ask later, Casey said entering the campaign has been educational. “It’s been quite an eye opener, this campaign” he said before saying journalists obviously have papers to fill. 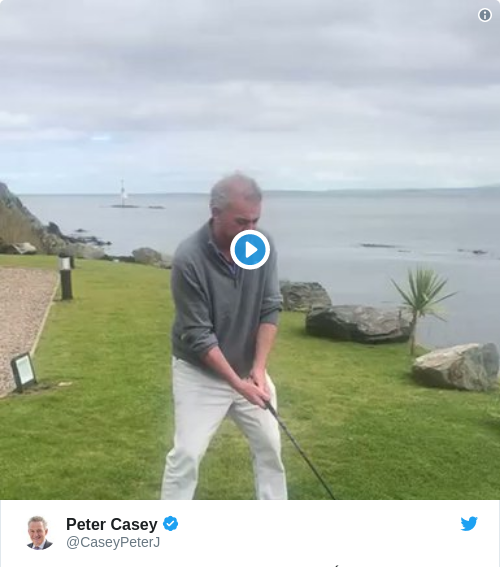 Casey also clarified that despite claiming in a tweet that he had retrieved the golf ball from the water, after outrage on social media, he didn’t get back the actual ball he drove into the water. You know that was tongue in cheek, I think if anybody thinks that was the case, then you know. I did actually go down and retrieve a ball but it wasn’t the one. Casey’s views on the access of the Jewish community to the White House have also raised some eyebrows. In an unpublished 2014 interview with the Sunday Business Post, the newspaper reports he said he was jealous of the access Jewish people have to the US President, “We get to the White House once a year, they basically live in it. Don’t get me wrong, I’m not resentful, I’m just jealous”. He told O’Rourke his comments on the matter were taken out of context. Again a very good example where somebody left out the first part of the interview. Casey said he entered the contest because he was raised to believe he could make a real difference to society. He also put forward his plans for a ‘Birthright’ programme for the children of the Irish diaspora, that he would implement if elected. A couple of weeks in the Gaeltacht to understand what rural Ireland is about. A week up in Belfast or Derry to understand the history of the troubles and a week down in Dublin to understand just how amazing Dublin is. A spokesperson for Senator Freeman has told TheJournal.ie that she has no comment to make on the matter. Email “Peter Casey's offering Joan Freeman a loan to fund her campaign (and he insists he's serious)”. Feedback on “Peter Casey's offering Joan Freeman a loan to fund her campaign (and he insists he's serious)”.